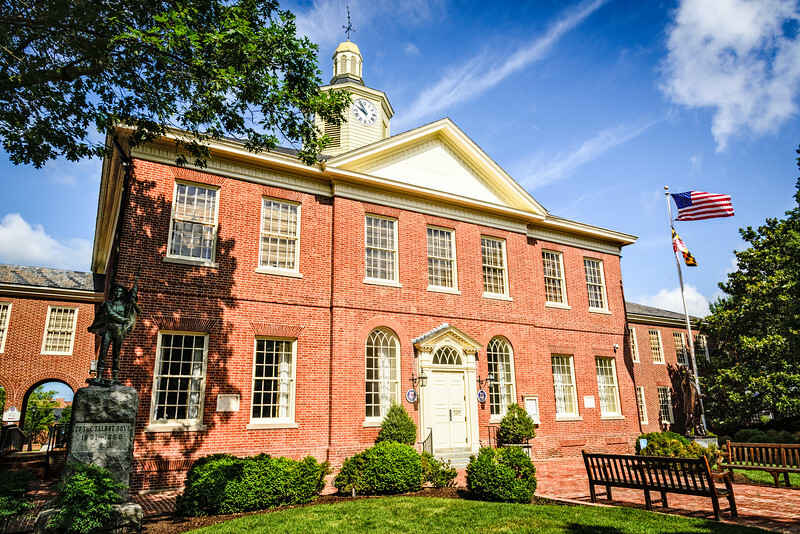 The Talbot County Courthouse occupies a shady, landscaped square on the Eastern Shore of Maryland in the town of Easton. 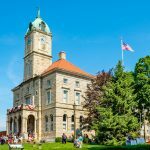 In fact, it was the establishment of the courthouse which caused the creation of the town. 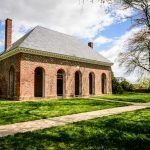 Initially called “Talbot”, the aim was for it to serve as Maryland’s “Little Capitol” on the Eastern Shore. Talbot County was originally formed in 1661. 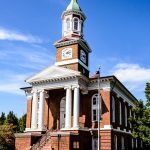 It was not until almost 50 years later that the need for a court house to serve the county was met. In 1710, an order was passed “that the Court hath appointed to meet at or near Pitt’s Bridge…and to treat with Philemon Armstrong, owner of two acres of land near said bridge in this county.” One hundred and fifteen thousand pounds of tobacco, the main currency of the day, was to be paid to Armstrong for his land. The construction of the courthouse was the responsibility of Philemon Hemsley. A 20- by 30-foot building was constructed to serve as the original courthouse. 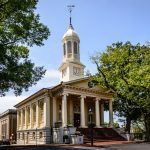 Not long after Independence from Great Britain and the formation of the new United States of America, it became apparent that Talbot County needed a larger Courthouse. In 1786, an Act was passed entitled “An act to erect a town in Talbot County, called Talbot”. Commissioners were appointed to survey the land and “…cause the streets, lanes and alleys to be named”. In 1788, an amendment to the act creating the town was passed such that the town shall “…hereafter to be called Easton”. The new Courthouse was constructed by Cornelius West on the site of the original structure. The county paid 599 Pounds whilst the state paid 2,500 Pounds. The court, which opened in 1794, was used as both the general and the county court. The building has undergone several enlargements and additions in the intervening years. The original 1794 structure remains as the central block of what is now a quite extensive government complex. 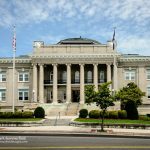 The Talbot County Courthouse is included on the Maryland Inventory of Historic Properties. The narrative supporting the listing is the source for most of the information used to create this post. 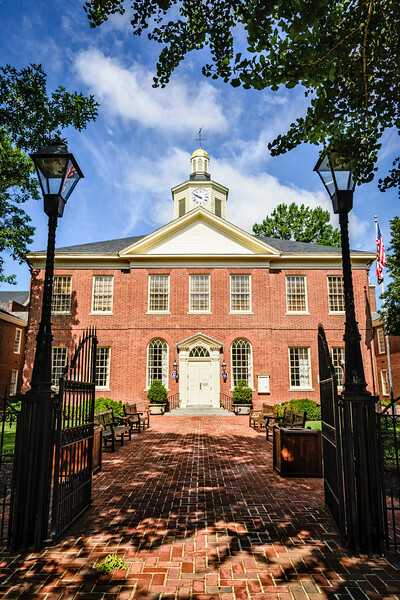 The Talbot County Courthouse was built in 1794. 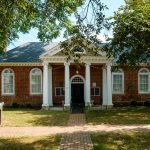 It occupies a shady, landscaped square on the Eastern Shore of Maryland in the town of Easton.